Guru Gobind Singh Jayanti is an extremely significant festival among Sikhs all over the world. It is a day to commemorate the birth anniversary of Guru Gobind Singh, the tenth Sikh guru. When is Guru Gobind Singh Jayanti? He was born on 22nd December 1666 in Patna, Bihar, India. The day either falls in December or January as per the Gregorian calendar. The celebrations of Guru Gobind Singh Jayanti takes place as per the Nanakshahi calendar. Guru Gobind Singh was one of the most sacred, influential and learned gurus who was the tenth and the last living gurus of the Sikhs. Other than a Guru, he was also a warrior who protected Sikhism by fighting off others. He was also a divine philosopher and spiritual leader. Guru Govind Singh evoked faith and had great participation in forming Khalsa, the pre-form of Sikhism. At the age of 9 years, he succeeded his father Guru Tegh Bahadur who attained martyrdom while protecting the religious freedom. He belonged to the sacred lineage of Sikh Gurus and was the last leader of Sikhs because there was no successor left behind as all four sons of Guru Gobind Singh attained martyrdom. Why Do We Celebrate Guru Gobind Singh Jayanti? During his lifetime, Guru Gobind Singh fought for justice and firmly stood against the Mughals. In the year 1699, he took a total of 5 people from the lower castes and then baptized them and announced that all these five men are his beloved. He endowed them with courage, wisdom and immense devotion to God. He taught them the power of fearlessness and dedication to the almighty who protects all oppressed individuals. 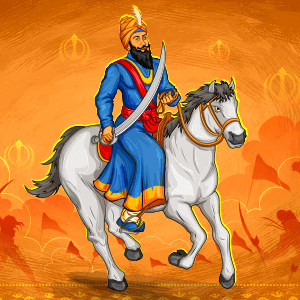 He established the Khalsa who was a renowned military force comprising saint-soldiers. Khalsa strictly followed a spiritual discipline as well as a moral code under the supervision, inspiration, and guidance of Guru Gobind Singh. Because of the courage evoked by him, people fearlessly fought against the oppression of Mughal rulers. Along with a military leader and spiritual person, Guru Gobind Singh was also a learned poet and writer who had penned huge literary and scholarly work. Prior to his death in the year 1708, he announced the Guru Granth Sahib as the permanent Sikh Guru which is a Holy scripture in Sikhism. The occasion of Guru Gobind Singh Jayanti is celebrated with grand fervor comprising bursting of crackers, lighting lamps, and diyas and also visiting the sacred Gurudwaras. Special prayers and processions are held on the eve of Guru Gobind Singh Jayanti and it is also well known as Prakash Utsav or Prakash Parv in many regions of India. Irrespective of the religion, caste, and creed, a huge amount of food is prepared for all the visitors in the Gurudwaras and is distributed as Langar. Reciting of Guru Granth Sahib is one of the most significant rituals which is performed on the day of this spiritual festival. All the celebrations last for a period of three days as two days prior to the Jayanti, the priest (Granthi) starts with the reciting of sacred Guru Granth Sahib. This ritual is known as performing the Akhand Path and this is observed at all the Gurdwara. The procession takes place a day prior to the actual celebrations and it is followed by dancers and musicians and led by the Panj Pyares. Devotees chant devotional songs at the time of procession and also distribute sharbat or cold drink and sweets to the people. Poems and historical lectures are also narrated on this particular eve in order to worship and praise the Guru. During the early morning, Asa di Var (morning hymns) are recited which is then followed by the reading of Guru Granth Sahib.